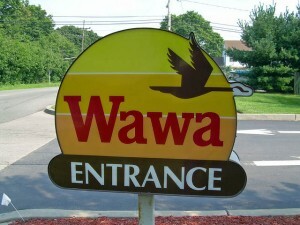 According to the company’s website, Wawa.com, their main focus is “To Simplify Our Customers’ Daily Lives.” This attitude is expressed in their core values as well, which are to appreciate people, do the right thing, please customers, welcome change, do things right, and a maintain a passion for winning. The company prides itself in offering a large fresh food selection, including fresh fruits and salads to go. “Wawa” is Native American for the Canada goose found in the Delaware Valley. This is why a goose is depicted on their corporate logo. At the turn of the century, Richard D. Wood operated a store in Greenwhich, NJ. He sold dry goods, pork, cheese, and other products from his own farming activities. A relative, George Wood, moved to Delaware County, Pennsylvania and began to operate dairy farms in an area known as Wawa. The area specialized in safe, certified milk. After World War I, demand for the milk from Wawa Dairy Farms grew and they began to deliver the milk directly into the city by truck. The business continued to be a success and in 1964, a family descendant, Grahame Wood opened the first Wawa Food Market in Folsom, Pennsylvania. Wawa supermarkets continued and by 1972, the company had opened its 100th store. They began serving freshly brewed coffee and sandwiches, as well. Through the years they have continued to grow, adding touch screens to make sandwich ordering faster, as well as convenience store/gas stations. The company is still headquartered in Wawa, Pennsylvania. The Wawa Dairy is still in operation, as well. In fact, it produces more than 100 million liquid quarts, which supplies all of the Wawa stores and other wholesale customers. Their line of milk is both delicious and nutritious, as well as being rBST free. Currently there are a total of 570 supermarkets. Annual Sales – by the end of the fiscal year 2010, the company reached $5.9 billion in total sales. They currently hold 0.8% of the retail grocery market, out of the top 50. Number of Employees – the company employs 16,000 people. Wawa carries its own brand of foods. Along with cooked sandwiches and soups, the stores contain salads and fresh fruits. The Wawa brand items are dairy products such as ice cream and milk. There are also Wawa brand teas, fruit drinks, and coffees. You can buy Wawa brand foods, such as their sandwiches and wraps freshly made or in premade packages. The company also runs a Wawa Hoagie Fundraising coupon program that allows people to use their sandwiches for fundraisers. Visit Wawa.com for more details.